January | 2015 | Careerschap | The musings of a careers professional in the higher education sector. I’ve just finished reading the annual High Fliers graduate market report for 2015 and so I wanted to report its main highlights for those of you with limited time. First off it’s worth noting the research by High Fliers is focused on The Times Top 100 graduate employers for 2014, so it’s a snapshot of the labour market, but nonetheless an interesting one. More comprehensive data on the UK graduate labour market can be sourced through , Higher Education Statistics Agency’s Destinations of Leavers from Higher Education survey (DLHE), the AGR and the ONS. I must admit to getting a sense of déjà vu from the 2014 report which I blogged about here. Many of the headline messages and themes are the same – especially around job growth and graduates needing work experience. So I’ve grouped together what I think are the main findings and points of interest below. The graduate job market is healthy with continued growth. We’ve also broken through the psychological barrier of passing pre-recession 2007 levels of recruitment. Student numbers into HE have dipped from the heights of 2009/2010 but are still strong which means there are more vacancies for undergrads/grads to apply for. What may be a game changer is the removing of the cap of student numbers into higher education. It is questionable if supply will keep up with demand with such a transformational policy. This substantial increase in graduate vacancies for 2015 takes graduate recruitment beyond the pre-recession peak in the graduate job market in 2007 and means that there will be more opportunities for this summer’s university-leavers than at any time in the last decade. 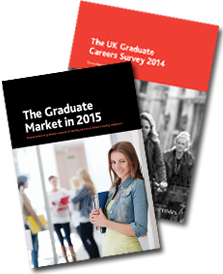 The UK’s leading employers plan to expand their graduate recruitment even further in 2015 with 8.1% more entry-level vacancies than last year, the third consecutive year that graduate vacancies have increased. The 1st year is the new final year. The recruitment and selection pipeline gets earlier and earlier and the 2015 report echoes the same messages from the previous year. I think this is one of the main factors driving the employability agenda in HE. Careers services are savvy enough to know that if students are not ticking certain boxes their chances to get on the graduate treadmill (if that is the aim) are severely diminished. It also demonstrates why universities are investing heavily in employer engagement staffing and activities. The term “business development” is also becoming more prevalent in HE circles are institutions strive to create mutually beneficial relationships with business. Recruiters have confirmed that 31% of this year’s entry-level positions are expected to be filled by graduates who have already worked for their organisations, either through paid internships, industrial placements or vacation work. Over four-fifths of the UK’s leading graduate employers are offering paid work experience programmes for students and recent graduates during the 2014-2015 academic year – an unprecedented 13,049 paid work placements are available. Two-thirds of employers provide paid vacation internships for penultimate year students and over half offer industrial placements for undergraduates (typically lasting 6-12 months as part of a university degree course). Many more employers now also have work experience places for first year undergraduates – over a quarter of organisations offer paid internships and two-fifths of employers run introductory courses, open days and other taster experiences for first year students. A change in perception and approach: Students very often gravitate towards well-known, trusted prestige brands when applying for graduate positions. Aldi may not initially be on everyone’s shopping list (sorry!) but the salary makes you sit up and take notice. If recruiters talk about the “talent” (so not necessary the subject knowledge and degree title) then surely the synergy to this is graduates must look at the “opportunity”. I think this is an important point for careers professionals to make to students in their discussions. More places, more applicants. Evidence of the employability agenda shining through in HE? Seems to suggest undergraduates and graduates are making more timely and better quality applications. A third of employers said they had received more completed graduate job applications during the early part of the recruitment season than they had last year and a similar proportion believed the quality of applications had improved too. Together, the UK’s top employers have received 6% more graduate job applications so far, compared with the equivalent period in the 2013-2014 recruitment round. Looking back to Connexions and my 1995 careers interview. I’ve finally had chance to watch the video of the iCeGs 17th annual conference from Tristram Hooley’s blog which happened back in Nov (there is a link to the video and transcript as well) . I’ve heard Professor Tony Watts speak before so was keen to listen to his final lecture before he retires from his professional life in career development. The video is one hour and brilliantly captures the last 50 years of history, progress and events that have shaped where we are today. My interest particularly peaked during two points in the discussion that resonate with my own personal & professional life. Firstly the idea of a golden age of careers in the mid 90s (well the claim it was as good as it ever has been) and the events leading to the rise and fall of the Connexions service. My own personal reflections perhaps go against the status quo on the pervading feeling out there on this but I’d like to qualify them from two perspectives. Golden age of careers in the mid 90s: In the mid 90’s (well 1995 to be exact) I was preparing to leave compulsory education from a very bog standard comprehensive and head into the big wide world without a clue as to where I would end up. I’d been the recipient of one Careers Advisor appointment which I’d found to be a rather random and forced process. As memory serves me it went as follows. A list of names were called out in morning tutorial time and those selected were told to arrive in the library at our designated slot for our one and only Careers Appt. I remember the talk in the class at the time was that the Careers Adviser would be there to help tell us decide what we should do. Up until that point I didn’t know the Careers Service A) existed B) we had a Careers Adviser linked to our school C) any prior knowledge this appt would take place. I’m pretty sure my friends didn’t either. My recollections of the appointment itself are that the careers professional was likeable and well intentioned but we never ventured beyond the main idea I’d presented to her which was to work in a travel agents. This idea had been formulated from my one week work experience in year 10 where surprisingly enough I’d been told I was going to have to work at the local Lunn Poly (remember them!). The option of a follow up appointment was never brokered nor was any real probing beyond the presented idea. I came away non the wiser still confused as to my intended path, apart from having garnered some additional information on local courses as we were still pre-internet back then. There was no what I call “track and trace” later on. I was left to my own devices from that point onwards. A couple of weeks later I was given a typed action plan from the meeting by my personal tutor. I’ve read Paul Chubbs well argued guest post that points to the robust nature of mandatory service standards and funding at this time and in fairness there is balance to what he has written when referring to the churning out of action plans to meet targets. The practitioner in me will always ask the critical question, “how can we be sure we are meeting client need?” Infrastructure and goodwill alone does not always correlate into the intended end user experience. It has to flow down, regardless of how well we perceive things to be going at the top. One of the criticisms labelled from the coalition at Connexions was that it was patchy but my first hand experience of the mid 90s careers service on a local level was underwhelming and flawed. The rise & fall of Connexions: I felt fortunate to work for the local Connexions service for just over 7 years so I was there for a substantial part of its shelf life. It’s rise and fall and the reasons behind this have been done to death and the debate has now moved on to how and where the gaps it left need to be filled. Some people are glad it’s gone, some are ambivalent and some like myself who worked on the inside and could see its true value now whistle be careful what you wish for. Like any service it had it’s faults and some of the criticism was well-founded but the performance metrics drove behaviour (and funding) towards a targeted service which is what we were staffed and funded to deliver rather than the targeted and universal service we would have liked to deliver. Careers work was always in Connexions, and many partnerships actually ring fenced staffing and split teams so it remained delivered and protected. Near the end, during the slow death of the service from 2010, dissenting agenda driven voices highlighted everything the service didn’t do, rather than what it did. As a national preoccupation we are inherently good at knocking down something we carefully build up, (just ask our sport stars on that count) so it was sad to see the human cost of the dismantling with experienced, talented, passionate colleagues leaving the profession behind forever. So there’s no going back but it’s worth remembering there was a lot worth saving amongst the patchwork. 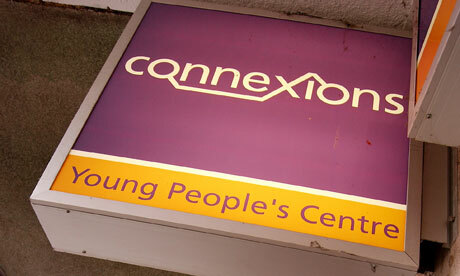 I for one was sad to see it go and am proud of what we achieved for the young people we served. 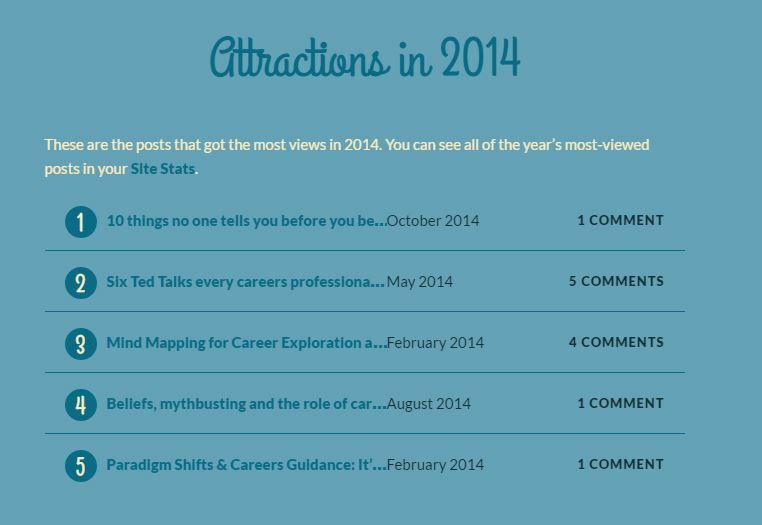 2014 blogging review: My five favourite posts. The site stats top 5 doesn’t quite match my own top 5, so in reverse order, here they are and why I think you should take a look! 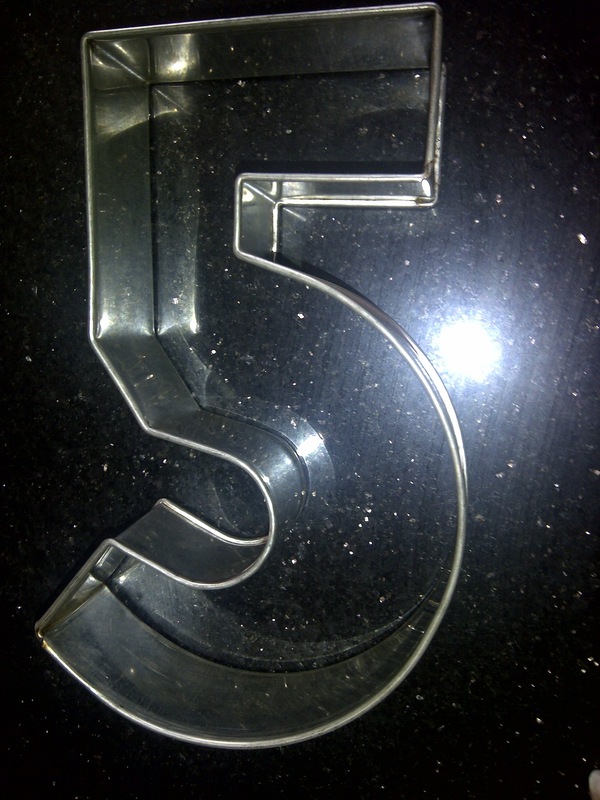 5) Logos, Pathos, Ethos: Three words that can transform your career: Three words that helped me re-think and evaluate my own public speaking and how people perceive you. I left this interactive workshop with a feeling of having learned some vital skills. I also left wishing I had attended a session like this 15 years sooner. Better late than never. 4) What is success? The implications for careers work: I tried to drill down and highlight how our own values and perception of what success is can influence (negatively & positively) our own professional practice. So what is success? I’ll let you decide. 3) The best advice I ever received: Based on a series of contributions from key influencers on LinkedIn under the title “the best advice I ever got” this post looks at how advice resonates with individuals to become memorable and meaningful. 2) Six Ted Talks every careers professional should view and why: I don’t profess to have seen all or even most Ted talks (there are over 1700 of them). In fact, I’ve only seen a very small proportion against the overall total. But here are six talks I have seen that I believe relate to my work and why they were thought provoking. 1) 10 things no one tells you before you become a Careers Adviser: The idea for this post came from reading an article by Carl Froch (he of pugilistic super middleweight boxing fame) when describing the woes and endeavour required to make it as an elite champion boxer and what they didn’t tell him before turning pro. Why not then apply this to the Careers Adviser and delve deeper beyond the sugar coated world you often have in training before you start out.